They say that law isn’t for the faint-hearted, and somehow it is true. Being a lawyer, you will be able to handle various cases from simple to the most complicated ones. It really takes guts to explain and to convince the jury that your client has strong evidence to win the case. 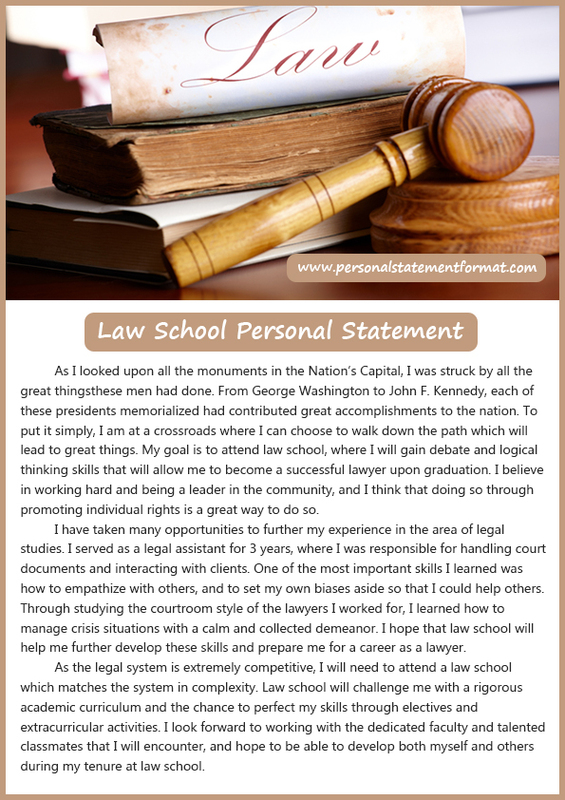 Well before all that, you will need to become a law student, and to start your journey, you will need to come up with an impressive, well-written law school personal statement template to use. Check business management personal statement template or personal statement template for college if you need. Before writing a personal statement, make sure to read enough about the school, its mission and vision, its stories and the characteristics of its students. See how you will fit into those standards by contemplating and thinking of the things that you might include or use in the law school personal statement template. Consider your audience and value their time. Know that the screening committee does not spend more than two minutes in a boring, monotonous and jargon-filled personal statement. Remember that a good writing is simple writing. If you use complicated terminologies, your personal statement is more likely is misunderstood lessening your chances to enter the law school of your dream. Instead, write in the simplest and most concise language by being very selective of the words to use. Content wise, you should stick with being informative and serious and not on fancy and casual tone. Remember that you are applying for a law school, where you should anticipate that lawyers themselves are reading your paper. Therefore, keep it simple and crisp in writing the personal statement following your chosen law school personal statement template. Be honest at all times, as there is no point in fabricating stories. Mention only real accomplishments and avoid make believe achievements, which will sooner or later, be caught further putting you at the bottom of the applicant numbers. Share your significant experiences, including the cases won and some practices, if there were, you did in the past. This may tackle a different angle of yours over other applicants who are yet to obtain their first ever job related experience. Nevertheless, be able to discuss your unique selling points including some law firm experiences, achievements and skills acquired while in the process of developing yourself before reaching this point, an important aspect of a law personal statement template you should not miss. The bottom line of all these is that you write a unique, truthful and clear personal statement that does not need to be long but to be very specific of purpose. Therefore, highlight your most important attributes and achievements that make you the perfect candidate. In addition, our experts will be glad to help you with a software engineering personal statement if needed. Learn more from a good law school personal statement template today!